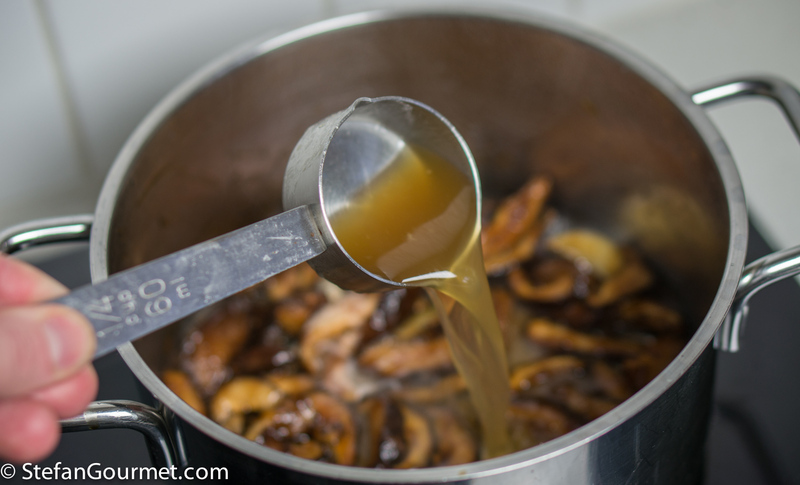 Put 12 dried mushrooms in a heat-proof bowl and cover with 250 ml (1 cup) of boiling hot water. 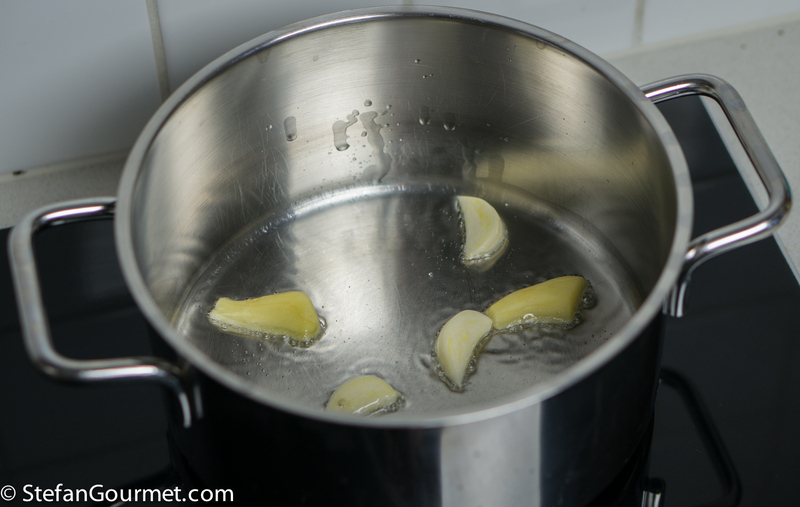 Put a dish on top so they stay submerged, and allow to soak for 30 minutes. Meanwhile, start prepping the sauce. 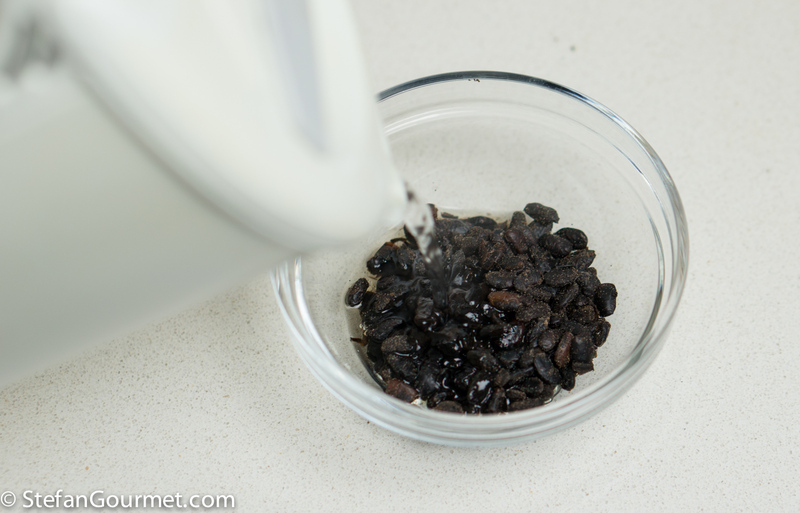 Cover 2 Tbsp of fermented black beans with hot water, allow to soak for 1 minute, then drain. Mince the black beans and put in a bowl. 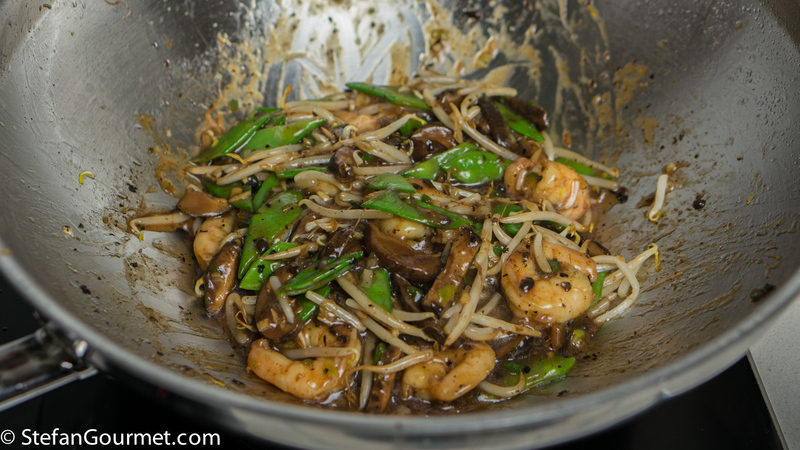 Add 1 Tbsp minced garlic, 1 Tbsp minced ginger, 1 minced green chilli, and the minced white part of 2 scallions. Reserve the green part for garnish. 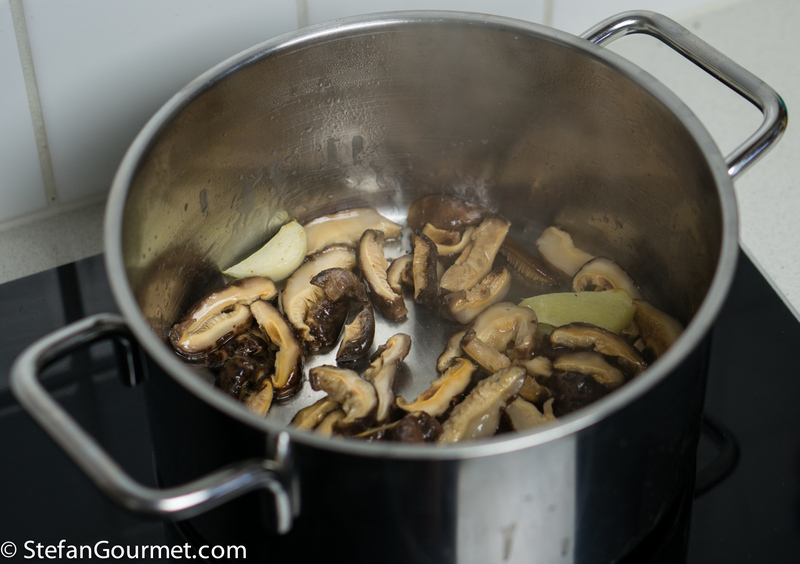 Drain the mushrooms, reserving the soaking liquid. 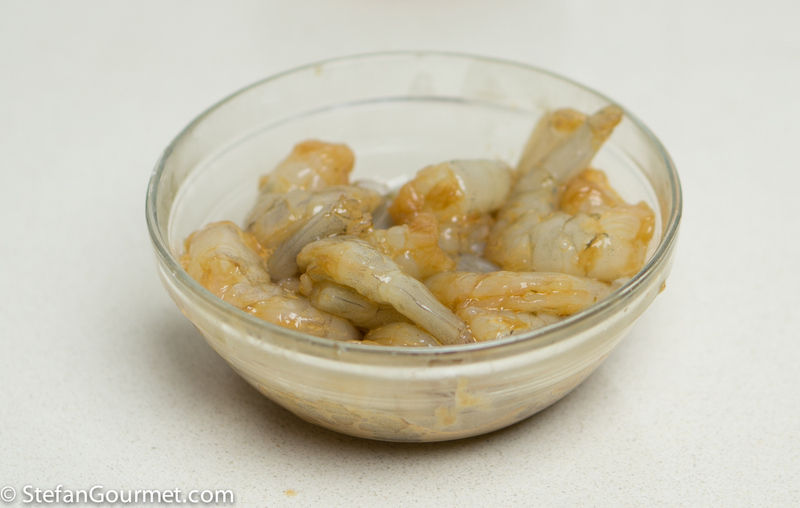 In a small pot heat 1 Tbsp peanut oil, then add 1/2 inch fresh ginger, peeled and lightly smashed, and 2 garlic cloves, peeled and lightly smashed. Stir until fragrant, about a minute. 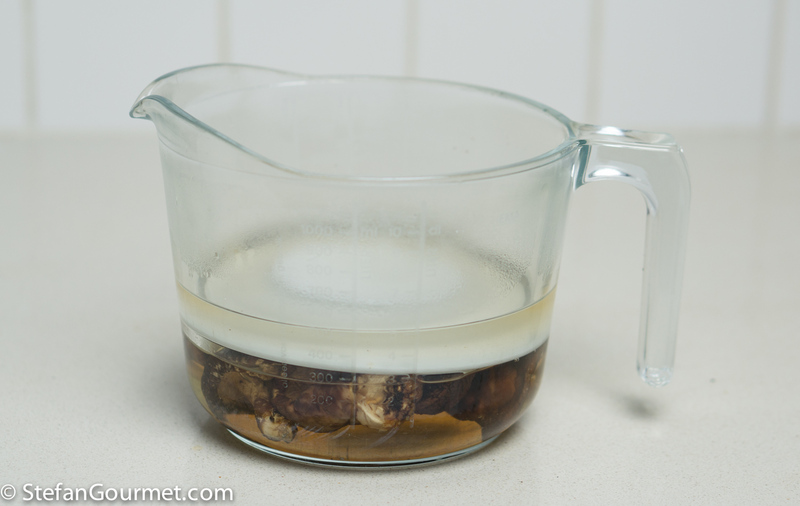 Add 1 Tbsp shaoxing wine and stir for a minute. 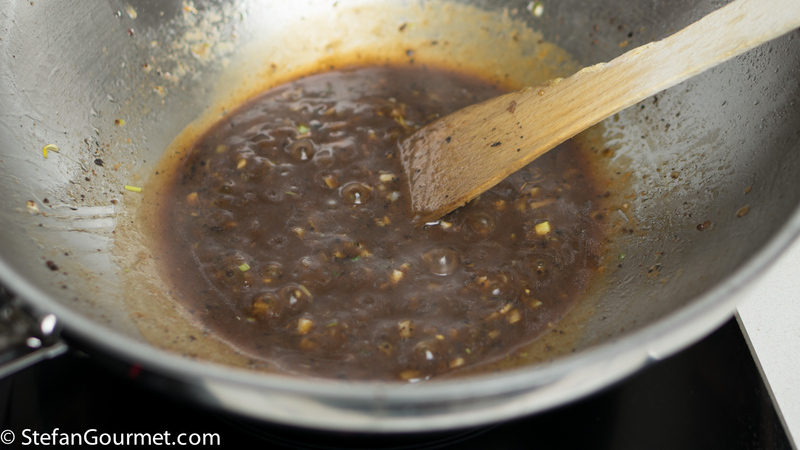 Then add 1 1/2 Tbsp oyster sauce, 1/2 Tbsp dark soy sauce, 1 tsp sesame oil, 1 tsp sugar, and a pinch of white pepper. 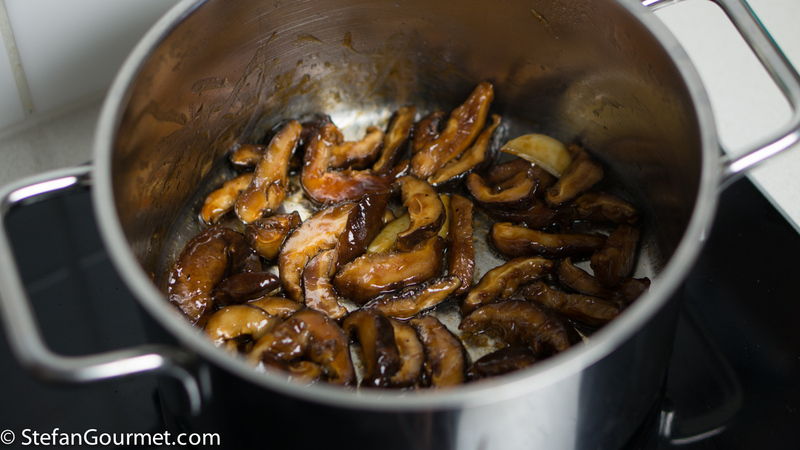 Stir until the mushrooms are well coated. 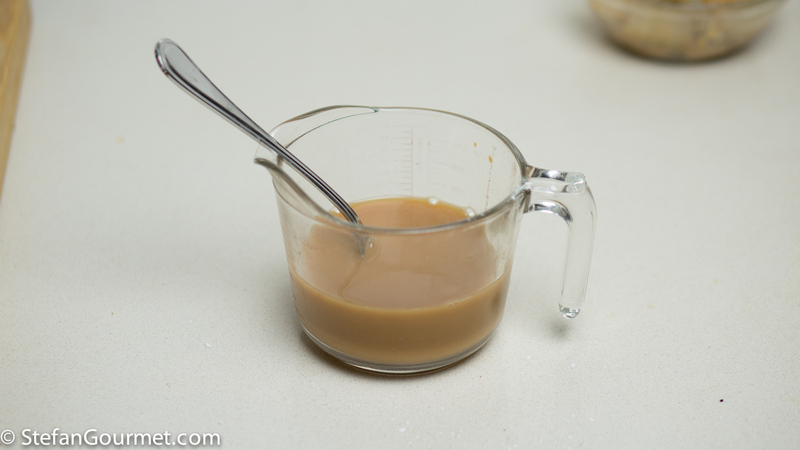 Add 60 ml (1/4 cup) chicken stock. 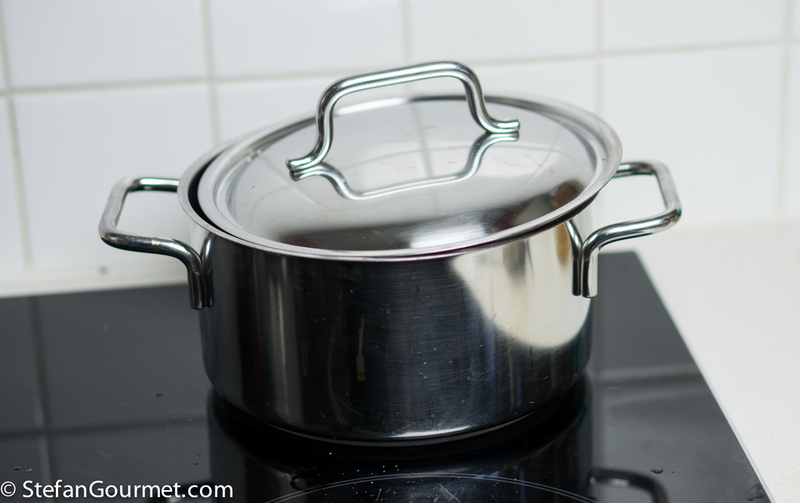 Cover with the lid slightly cracked, and cook at a low simmer for about 30 minutes, stirring occasionally. 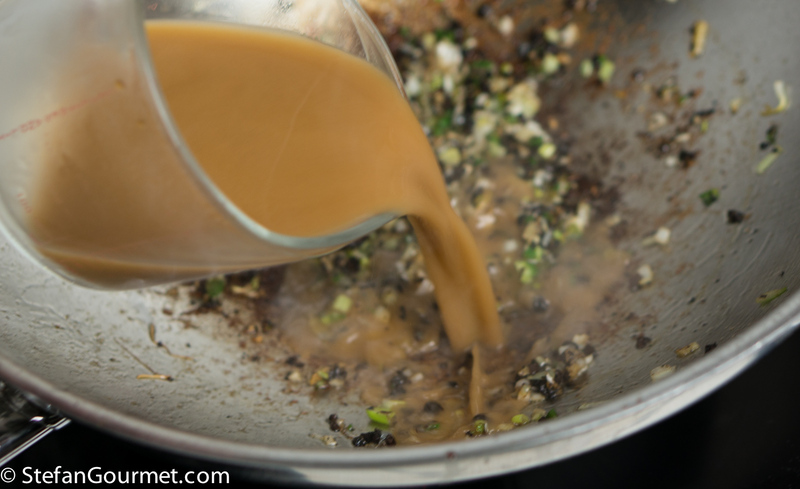 Add the remaining 60 ml (1/4 cup) chicken stock as soon as all the liquid has been absorbed. Taste and adjust the seasoning with salt, if needed. Reserve the mushrooms. 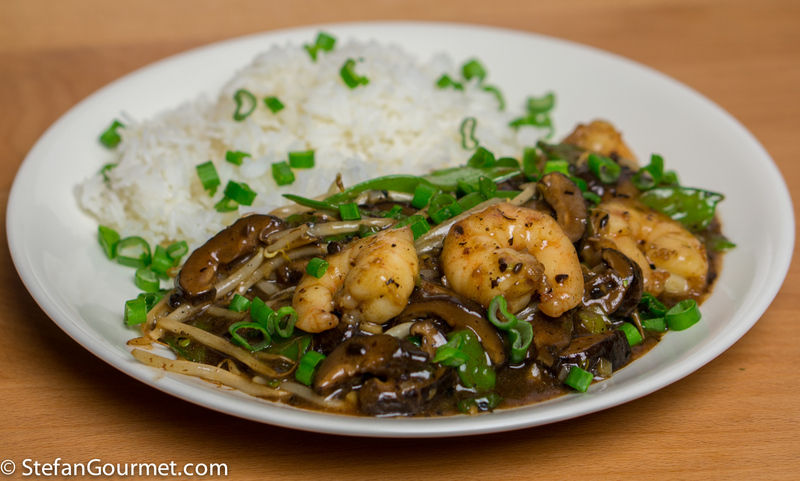 While the mushrooms are braising, combine 225 grams (.5 lb) of shrimp in a bowl with 1 Tbsp corn starch and 1 Tbsp shaoxing wine. Stir and allow to marinate for 15 minutes. 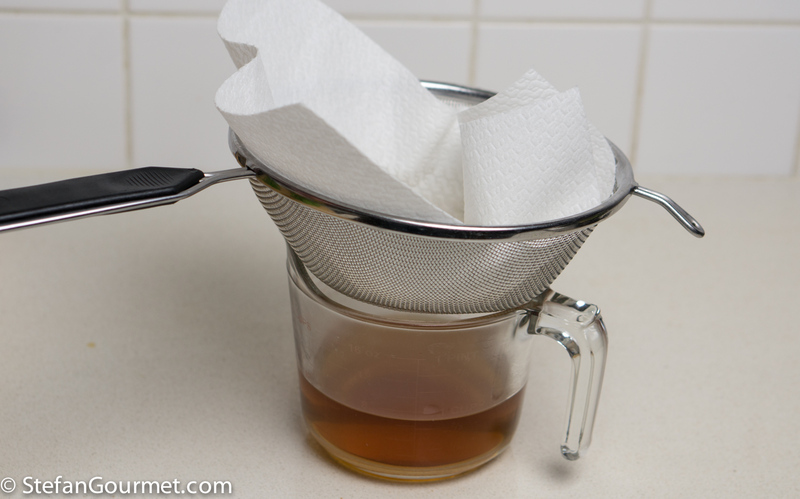 Filter the reserved mushroom liquid. 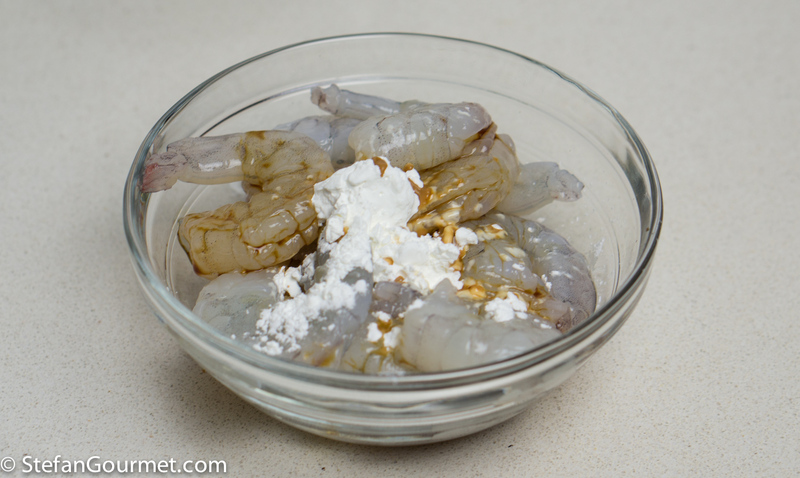 Add 2 Tbsp oyster sauce, 1 Tbsp corn starch, and 1/2 Tbsp sugar, and stir to mix. 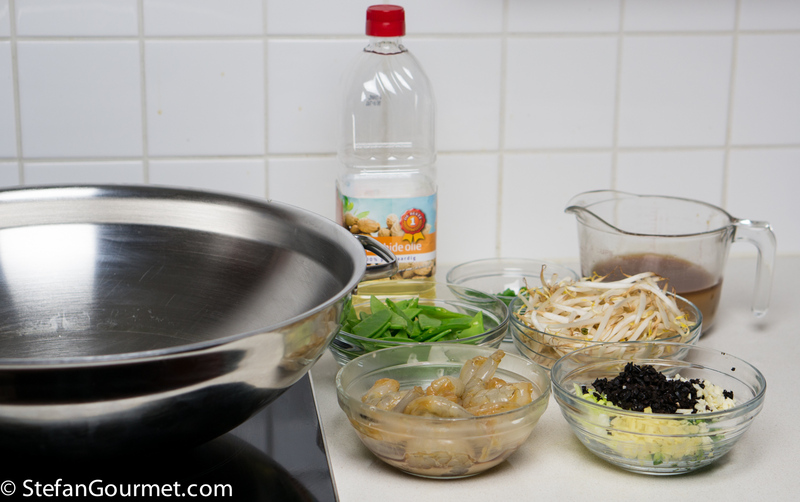 Assemble all the ingredients: marinated shrimp, minced aromatics for the sauce, liquid for the sauce, bean sprouts, snow peas, braised mushrooms, and peanut oil. 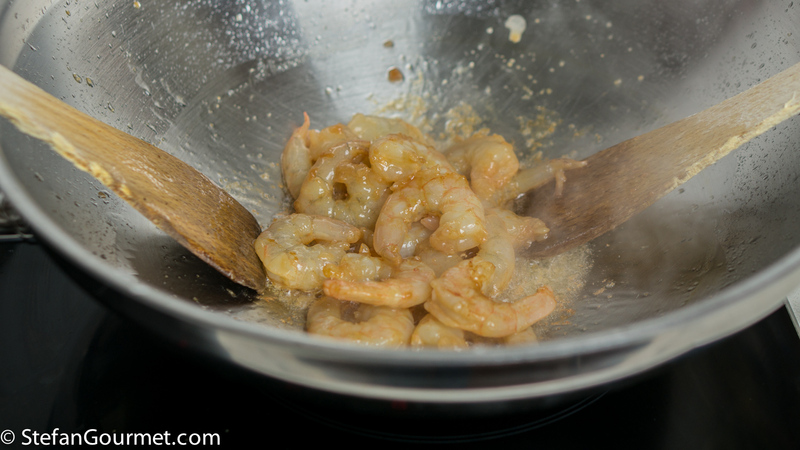 Start by stir frying the shrimp in a wok with peanut oil. Lift them out with a slotted spoon as soon as they start to color, and reserve. 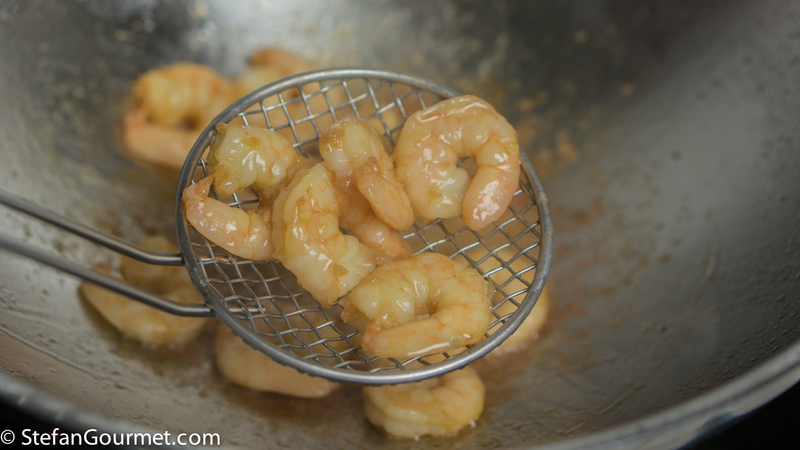 Do not overcook the shrimp, as that will make them tough. Next stir fry the snow peas for about 3 minutes. Add peanut oil if needed. 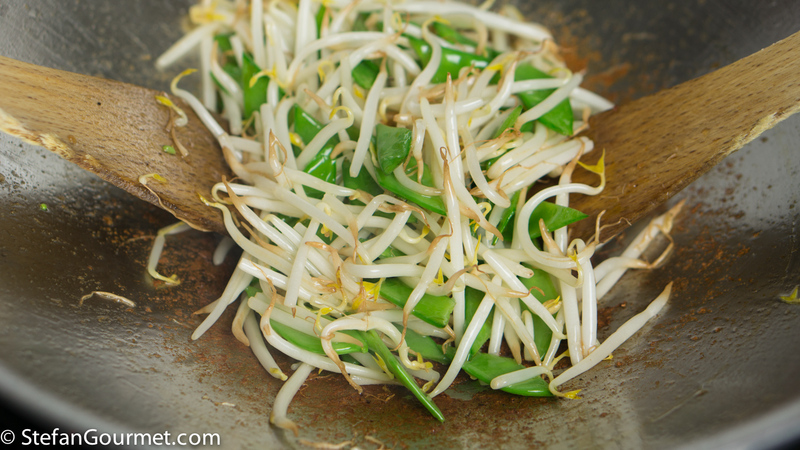 Add the bean sprouts and stir fry for another minute, then lift out of the wok and reserve. Stir fry the minced aromatics for a couple of minutes or until very fragrant. Then add the sauce base. Bring to a boil and allow to reduce for a bit. 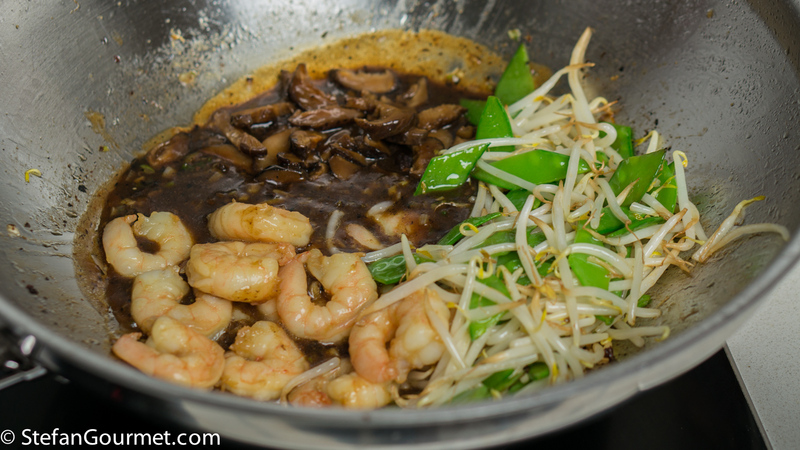 Add the reserved shrimp, braised mushrooms, and vegetables. Stir to mix and allow to warm through. 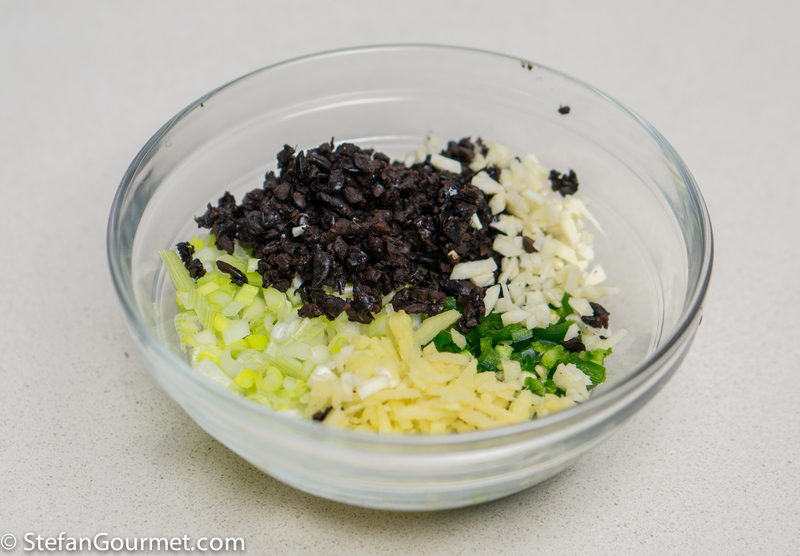 Serve with white rice, garnished with the green part of the scallions. 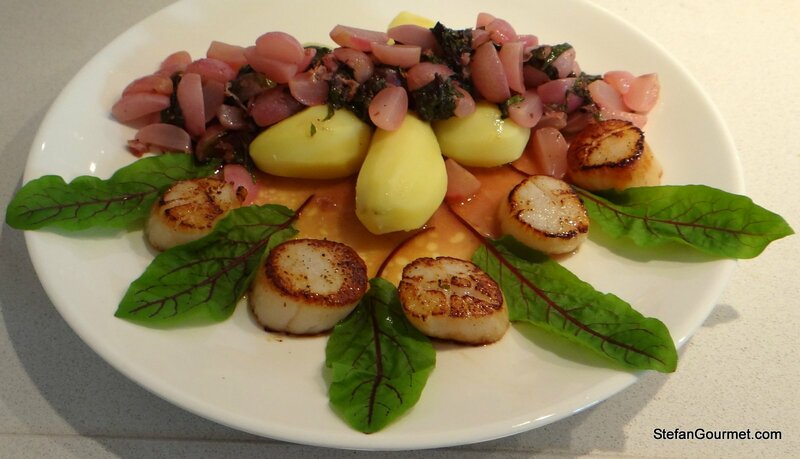 An original dish: scallops with radishes and sorrel sauce. Wow!! Non posso dire altro: questa ricetta mi ha lasciato senza parole…. e non è facile! Buon viaggio e buon arrivo! Ci lasci una carolina dall’Olanda davvero ricca di sapori. First of all, have a wonderful Italian holiday 🙂 ! This is ‘my’ kind of dish naturally tho’ I do make it far more simply! Occasionally grow my own shitake but that is a bit of a business on a tree trunk!! Your dish must have quite some depth of flavour as you have both shitake and black beans in the recipe . . . honestly, have to try it ‘your way’ !!! 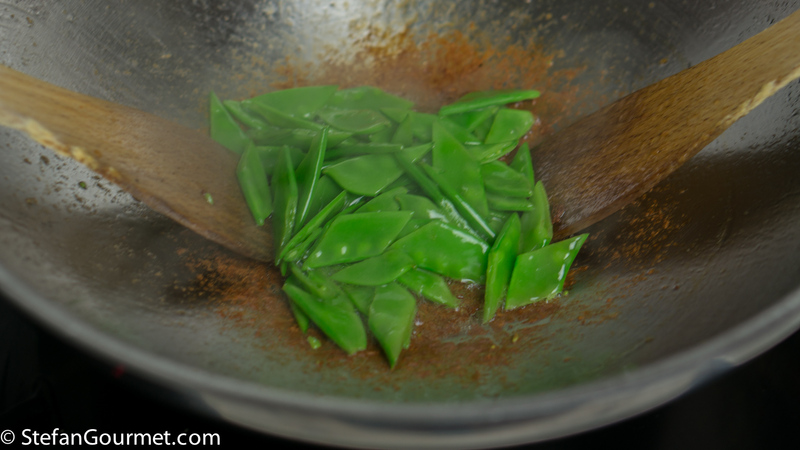 And love the crispness of the snowpeas . . . using the in a squid stirfry for lunch today . . . Thanks, Eha. I have seen trunks with shii take spores to buy, but I’ve never actually tried that. 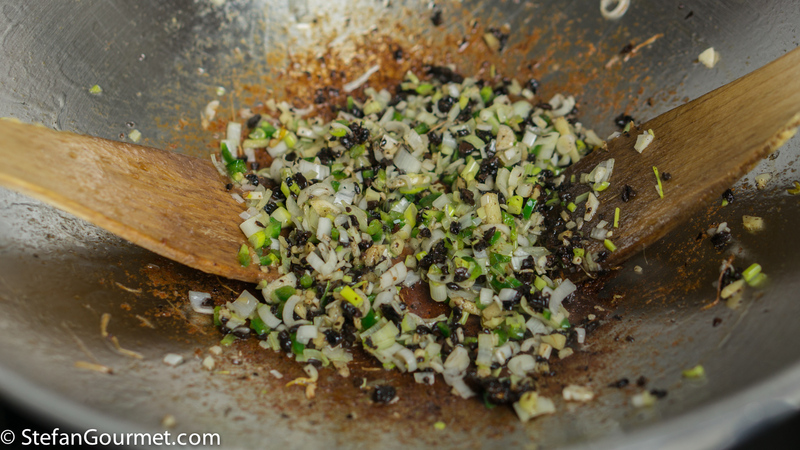 With shii take, black beans, oyster sauce, ginger, garlic, and chilli, it sure has depth of flavor. My kind of stir fry! I bet it was so tasty, Stefan. 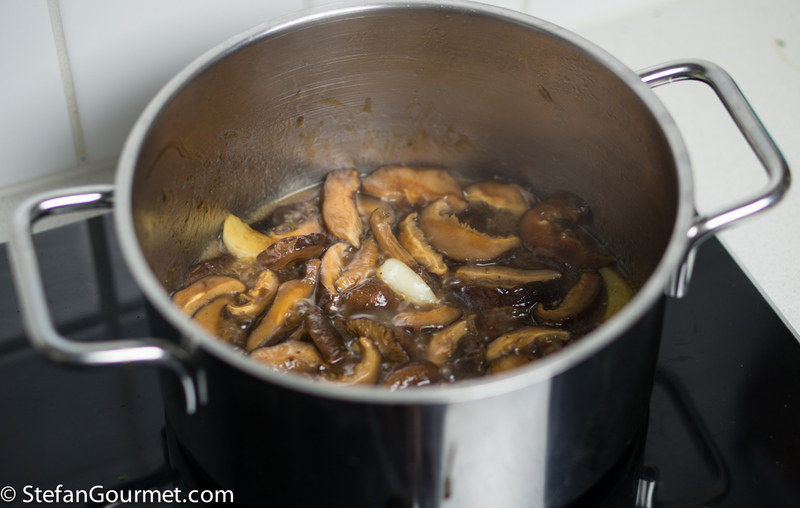 I love stir-fry dishes made with oyster sauce, especially ones with shiitake mushrooms in them. 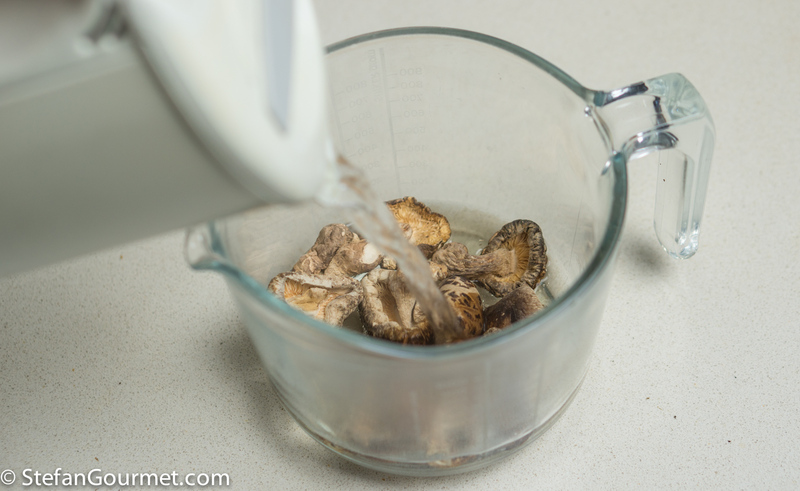 To avoid chewy texture, and obtain soft easy to chew texture, I soak dried shiitake mushrooms in room temperature water in an air tight plastic container, in the refrigerator overnight. Does 30 min soaking really do the job? I am curious. The 30 minute soaking in hot water plus the braising does the job. They retain a little chewiness, and I think it is a matter of personal preference whether you like them softer or not. I’ll try your method of soaking them overnight to compare. It may preserve the flavor better because there is no heat to destroy any flavors.